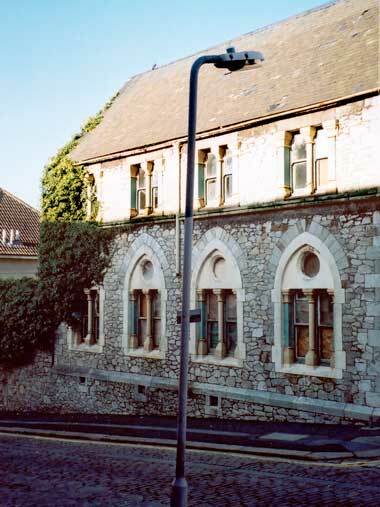 The building in the photo below was constructed 1860 as St. Paul's, a parochial school, but at the time of its demoliton in 2000 was commonly called Cornwall Street School. 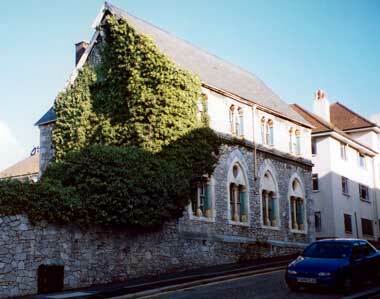 Cornwall Street School shortly before its demolition in 2000. The first mention of a school in Cornwall Street is White's Devonshire Directory of 1850; both Ragged and Evening Schools are listed, but whether this was the same or two different buildings is not specified. They were probably one and the same building, it probably stood on the same spot as St. Paul's above, and I'm guessing it was demolished by the admiralty in 1855. In 1856 the admiralty built a tunnel under Cornwall Street, and several surface properties along its path were demolished to make way for it. Since then no buildings have been located immediately above the tunnel - presumably because of the weight and safety factor. By 1860 the building in the above photo was constructed - St. Paul's Parochial School. It was located on the edge of the surface path of the tunnel, that path by then a lane, (being the gap between buildings in the photo) and it fronted onto Cornwall Street. My interpretation is that the church built it as a replacement for the demolished Ragged school. As with the demolished school, St Paul's newly built Parochial School was used as both a school and a mission chapel. Like so many Devonport buildings of this period it was designed by Piers St Aubyn. The plot, on the north side of Cornwall Street, was a triangular shape with the two classrooms overlooking Cornwall street and the playground at the rear tapering to the thin end bordering Cannon Street. Entrance was via the door in the side lane, which led into the playground. Education at St Paul's was Elementary. In the beginning there were about 140 pupils, infants only. Parents had to pay a contribution to their child's education, which various writers have commented was just one penny - Cornwall Street being a poor area one penny was all that could be afforded. According to Moseley (www.plymouthdata.com), Devonport School Board took control of the school on 20th July 1875, when the lease was transferred to them from the church; according to White's Directory of 1878 the lease was transferred in August 1876 (but Whites may have been a typing error since their later table gave an opening date of August 1875). During 1876 some internal alterations were carried out thereby permitting an increase of pupil numbers to around 200. Following adoption by the School Board the name St. Paul's was kept and the school continued to provide an elementary level of education until after WW2. St. Paul's was renamed Cornwall Street Elementary School when control of the school was passed once again, from Devonport School Board to the Local Education Authority. Following WW2 the school stopped taking infant pupils; it was renamed Cornwall Street Secondary Modern School for Girls. In 1963 a new secondary school was built in Devonport for both boys and girls, in Park Avenue. The girls from Cornwall Street school transferred to the new Secondary Modern and their old building closed as a school. Various groups used the property between 1963 and its demolition in 2000, including Devonport Amateur Boxing Club. The building was demolished along with the surrounding council flats in both Cornwall and Cannon Streets as part of the Millennium upgrade to the area. Another view of Cornwall Street School, which was half-way down the street on the right-hand side, or on the north side if looking at a map. Liz Cook 12 October 2009 - updated Sept 2012.